Drew Brees of the New Orleans Saints points to a receiver during a game against the Tampa Bay Buccaneers at Mercedes-Benz Superdome on Oct. 5 in New Orleans, Louisiana. “Playoff Implications” is a phrase you usually don’t hear until the final weeks of the NFL regular season, but almost every regular season game has playoff implications. In the early going, however, it can be difficult to figure out just what those implications are, and how much is riding on each game. Most other major sports leagues play a greater number of regular season games, and thus the playoff picture in those sports evolves in a more incremental fashion. The pace can seem glacial at times for MLB, and inevitable and foregone when it comes to the NBA. But with just 16 regular season games, the NFL’s playoff landscape can change dramatically over the course of a single Sunday afternoon. And these tectonic shifts take place throughout the season, not just in those final weeks of December. With a week or two left in the season, the “eye test” usually suffices for judging which games will shape the playoff picture. But in mid-October there are far too many possibilities for the unassisted human mind to make sense of. We can only speak in general terms. For example, we know the playoff chances for the New Orleans Saints will improve with a victory this Sunday over the Detroit Lions. But by how much? And how far would they drop with a loss? Expanding our focus, what other teams have a vested interest in the outcome of this game? One would expect Carolina’s playoff chances to improve with a Saints loss, given that the Saints are their division rival. But once again, by how much? To answer these questions, we’ve created a weekly feature that measures the playoff implications of each game. To do this, you need to be able to simulate the remainder of the season multiple times and analyze the results. And in order to simulate the season, you need a way to rank all 32 teams, and use that ranking to create outcome probabilities for future games. We’ve been doing just that with FiveThirtyEight’s Elo rankings. But the Elo ratings, simple and beautiful, aren’t the only word on NFL rankings. For this feature we’re going to turn to the wisdom of the crowd instead, and use a ranking system one of the authors developed based on betting markets. In stock market terms, think of it as technical analysis in lieu of fundamental analysis. UPDATE (Oct. 17, 12:30 p.m.): The interactive tables above have been updated to include Thursday night’s game, which now shows no playoff implications because its result is included in the playoff chances (the text of the article has not been updated). Reading the table across tells you which teams are affected by any particular game.2 Reading the table down tells you which games matter most to any given team. For example, if you’re a Texans fan, what games should you care about this week, how much should you care about them, and who do you want to win? The column headers are sortable, so clicking on the “HOU” column tells you to care about HOU @ PIT, ATL @ BAL, CIN @ IND, NYJ @ NE, CLE @ JAC, and KC @ SD — in that order. And you want the Texans, Falcons, Bengals, Jets, Jaguars and Chiefs to win. My rankings start from the assumption that the NFL gambling market is efficient, and then attempts to determine how that efficient market ranks each of the 32 NFL teams. Unfortunately, Vegas doesn’t actually share its rankings with the general public, but with a little reverse-engineering, we can arrive at a pretty good guess at what they are. We start with the point spread. For Thursday night’s game, the New England Patriots are a 9.5-point favorite at home against the New York Jets. Since home field advantage is worth about 2.5 points, the market thinks the Patriots are 7 points better than the Jets when playing on a neutral field. Armed with this interpretation, we then take the point spreads from each game and for multiple weeks and run a simple linear regression to arrive at a consensus ranking. The process is akin to drawing a map of the United States but nobody tells you a city’s location. Instead, they only tell you how far away each city is from another city (e.g. Los Angeles is 1,700 miles away from Chicago, Chicago is 165 miles from Indianapolis, and so on). To further complicate matters, our map “moves” over time, making earlier “distance” measurements less reliable. For example, the Steelers opened the season as a 6-point favorite at home against the Browns. If the market were to set that point spread today, Pittsburgh would most likely drop to just a 2.5-point favorite, as the Steelers have fallen short of preseason expectations, and the Browns have exceeded them. So, the ranking methodology gives more weight to recent point spread data in an attempt to get the most up-to-date market evaluation of each team. Now that we have a ranking system that assigns a probability to each future regular season game outcome, the next step is to simulate the season multiple times (50,000 times to be exact). After simulating win/loss records, we apply the NFL playoff seeding rules (plus tiebreakers) and summarize the results. There are already several sites that do these types of simulations for the purpose of producing team playoff odds (including FiveThirtyEight). For this feature, we’re going to go a bit deeper than that. Instead of focusing on each team’s overall playoff odds, let’s instead focus on each game. We’ll use the New Orleans-Detroit game as an example. Of the 50,000 simulation runs, there were precisely 30,180 (or about 60 percent) that resulted in a Lions victory, and 19,820 that resulted in a Saints victory. Let’s now focus on those two samples in isolation. Of the 30,180 simulations in which the Saints lost, they made the playoffs 8,273 times, or 27 percent. Of the 19,820 simulations in which the Saints won, they made the playoffs 9,172 times, or 46 percent. Put simply, the Saints playoff odds could swing by a not-insignificant 19 percent as a result of their game against the Lions. 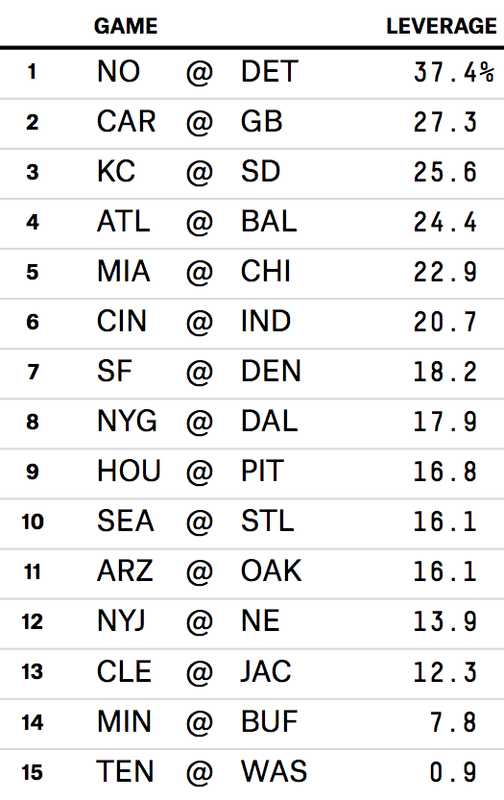 (The games with the most cumulative influence on the overall playoff picture (“leverage”) are listed at left). We can repeat this calculation for every game and every team. The result: A measure of how much every game matters to every team. The table is initially sorted by game importance, where we define importance by its cumulative impact on the playoff picture. Where you see blank cells on the table corresponds to games and teams in which there was not a statistically significant difference in playoff odds. Notice that we don’t restrict ourselves to just the two teams competing in each game. As we alluded to above, teams benefit when they win games, but they also benefit when division rivals (and other competitors for playoff seeding) lose games. The Panthers, for example, would see their playoff chances rise by 11 percent with a Saints loss to the Lions.